This poem is my perennial hope for every spring—to greet the dawning year with knowledge that now is the time to ask for what I really want, and to embrace being fully awake to the journey initiated by this desire. Desire takes us far this season. Desire plays a particular role in this spring’s awakening. This month, the story of spring becomes both intense and exciting, and Mars, the planet of desire, is telling the tale. 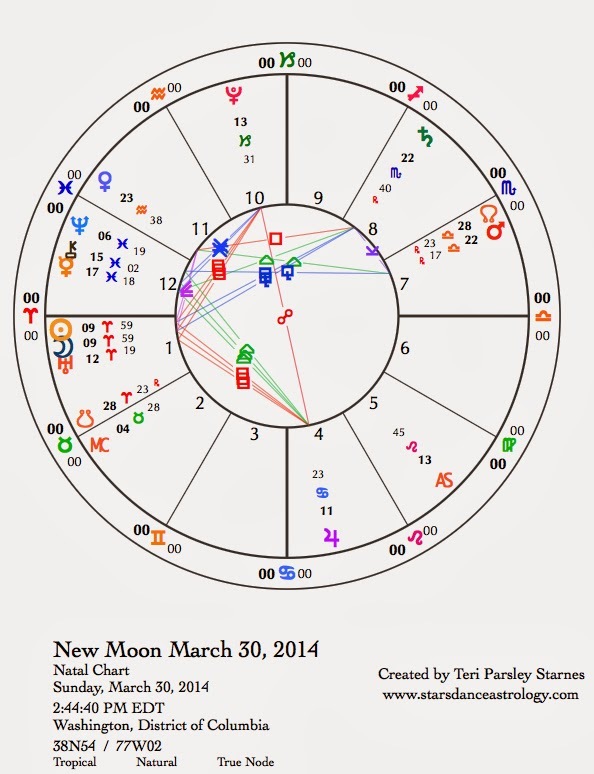 The New Moon of March 30 is the beginning of the astrological year. Although the Sun entered Aries on March 20, the season of emergence really begins at the Aries New Moon. The round door is open; there is activity now through the portal. People are going back and forth. Now, right now, what do you really want? Now, right now, it is time to listen to the secrets that the dawn breezes are whispering. Now, right now, it is time to finally shed winter’s protective layer. Now, it is time to greet the season with unabashed daring. Mars the storyteller. Mars the challenger. Every two years, Mars takes a retrograde journey. During this period, Mars spends more time in a sign. Usually this fiery planet, the ruler of Aries, moves briskly through the zodiac. Mars prefers Aries because this sign also likes to speed along. Reflection is not an innate instinct to Aries or Mars, but each Mars retrograde forces us to slow down to reflect on passion, drive, and desire. It can be quite a good thing to slow these energies, not only to cool hot-headed reactions but to spend more time savoring our desires. So, Mars retrograde isn’t exactly a bad thing, just a different thing. An opportunity, like so many planetary transits are, to go deeper, to become more mindful. Another piece to consider: Mars in Libra, the sign opposite Aries, increases the introverted nature of this Mars retrograde. Something is brewing inside us. Tensions can build if we don’t allow for more flexibility during this transit. Here is where it gets interesting. Jupiter, Uranus and Pluto will form a grand cardinal cross with retrograde Mars this month. Staying cool-headed about anything will be harder. We are reaching a crescendo in April. In some way, we each are changing; the earth is changing; the paradigms of culture are changing. But, remember that round door of awakening? That this is the time to ask for what we really want? Spring itself is asking us to risk uncertainty and exposure. We don’t want to play it too safe nor should we heedlessly embroil ourselves in turmoil when the gift of spring is a fresh start. The challenge this month will be to know when to be bold in pursuit of our desires and when to be more reflective. For now, my strategy is to practice enjoying the sensation of slowing down to savor my desire but not going back to sleep. The potential of this Aries season requires our whole attention. March 30—New Moon: Dreaming. Big energies are brewing. The spring feels like it starts today. The wonderful thing about Aries, the sign of the New Moon, is that the momentum of life takes over for us. We don’t have to try too hard to get things going—they want to go all on their own. An increasing momentum toward action and change is the theme of the lunar cycle. The Sun and Moon are near to the tightening aspects between Jupiter, Uranus, and Pluto in the chart for the New Moon. These planets of change have a mission to upset the status quo in favor of authenticity, renovated power structures, and strong places of protection and support. The tone they have been setting is one of uncertainty amidst change. Some of us can’t wait for the shift; others are wondering how to get our bearings. Transits to these planets this month will create spikes in this field of experience. The Sun and Moon begin the process. At each New Moon I begin to set intention for the lunar cycle. Some months, I know exactly what I need, at other times I use the three days after the New Moon to dream about where I to focus next. You have those options as well. Perhaps you will want to focus on defining what you wish to begin in this season of fresh starts. Or perhaps, like me, you want to focus on the strategies of beginnings, knowing that without much effort, new growth will happen anyway. I want to explore my fear of change, which keeps me from embracing new possibility. I want to practice radical engagement with the life force. I want to find a way to dance through the uncertainty with joy and compassion. I want to open wide my arms and feel alive and awake. With that desire as my guide, I begin to search for the ways I can manifest more wholeness and aliveness in this season. Other forces are present at the beginning of this cycle. Venus in Aquarius is square to Saturn in Scorpio. Relationship negotiation continues. Is the conflict between commitment and freedom? Is it between transparency and secrets? The struggle may be to make room for everything. Is it possible? Surely we feel the stress of trying to make it so. Neptune, Chiron, and Mercury in Pisces continue to attune our hearts to empathic connections as the lunar cycle starts. Mercury will leave Pisces for Aries at the start of the second week of this cycle. Words happen faster than thought under this Aries influence. It will help to avoid communication problems if we remember these heart connections. When Venus enters Pisces on April 5, we are given help to remain sensitive and tuned in to each other. Monday, March 31. Was your yesterday overwhelming or just very exciting? Spring winds can blow both ways. At least once today, practice spontaneity. Do something without forethought. Tomorrow is actually April Fool’s day, but with the Moon in Aries today, embrace the Aries/April fool in you. One of my favorite April fools, my friend Paul, says that when you goof up, just open your arms really wide and say as loudly as possible, “How fascinating!” Hopefully, each of us finds the fascination of foolishness today. Tuesday, April 1. Are you itching to get your hands in some dirt? Do it if you can! The Moon in Taurus is a fine time to plant a garden or at least start some seeds. The grounding of earth is a gift in tempestuous times. The Moon reinforces inspiration and belief. We feel stronger too. However, the Sun squares Jupiter and we might have a tendency to be more reactive when challenged. Sometimes a passionate response is appropriate, even desirable. Some of us will be feeling defensive, others like daredevils. Watch out for the sparks. Today, in honor of April fools everywhere, notice the times when you just don’t care what others think, and express yourself freely! Wednesday, April 2. The sparks continue today from the direction of the Sun’s conjunction with Uranus. Impatience or a strong desire to upset the status quo of your life is just a super-dosed expression of what the Aries lunar cycle is all about—going into the unknown to claim a lost piece of your authentic self. Aries is impulsive. Today is especially so. Mercury in Pisces contributes a strong desire to find our commonality, to merge our heart experiences into a story of collective desire. However, there is a struggle between the instinct to be true to ourselves and the sensitivity evoked by planets in the water signs. The elements struggle to work together. Here is a cooperative image: the banks of a river holding back the rising waters of newly melted snow. Under a dramatic spring thaw the river almost floods, but if we can hold fast to our boundaries, the energies flow well and we are cleansed. April 3—Crescent Moon: Beginning. Ah, the Moon phase of beginning in the season of beginning. Do you feel the rising energy? With the Moon in Gemini, it will be hard not to. We are ready to make connections with others on our way to embracing the transformative forces of this lunar cycle. Today the Sun is square to Pluto. The power of life emanating from the earth is palpable. Pluto is the force and god of compost. This planet rules the transformative process of death, but not to keep things dead forever. Through the power of compost, earth and life are renewed. We can notice what has finished composting in our lives. Has a past death become the start of new life? We honor both states, the mourning and the renewal. From this place, our beginnings are blessed. Friday, April 4.The last three days have set a pattern for this lunar cycle and for the entire spring season ahead. Have you found the thing you are most passionate about? How has that desire shifted your trajectory? The Moon in Gemini encourages curiosity. We want to learn something. The means are varied, but something is still missing, and a new fact or a new friend just might have what you are looking for. Let the joy of the desirous quest carry you forward into the weekend. Saturday, April 5. Of the two weekend days, this one will be the most mellow. A bit of communication mix-up could occur this morning (CDT). There is always more than one way to get our messages across. We notice the intersection between verbal and wordless expression today. Another shift: Venus enters Pisces until May 2. Venus is exalted in this water sign and she gives us a welcome respite from the hyperactivity of this month. Venus encourages reverie—the daydream that helps us attune to the beauty around and within. This is an enticing spice to add to our spring stew. When the Moon moves into Cancer this afternoon (CDT) and forms a harmonious connection with Venus, pause to appreciate the beauty surrounding you. You may even want to create something lovely in your home to honor the Moon and Venus.